I first heard of Brian Goodwin when I was travelling on the Scottish Marathon Club bus up to Kinlochleven Highland Games in the early 1960s. The bus had stopped at the Green Kettle at Bridge of Orchy for a cup of tea or whatever and we were standing outside talking when one of the runners mentioned that Brian had run some exceptional times in Finland. I first met Brian after running a good first stage of the McAndrew Relays not long after that – I had been in fourth/fifth up to the last run-in when three others passed me. I had just stopped and was gathering my thoughts nd breath when Brian said to Les Meneely of Shettleston (both just in front of me, and Brian was one of those who had passed me in the straight, that they had better watch out for me that season! An inaccurate prediction as it happened but we became friends there and then. I soon found out that he was a bit carnaptious and often began a conversation with a pseudo-insult which was quickly followed by a question about some aspect of running or someone he knew in Clydesdale Harriers. As indicated, Brian started out in the sport as a runner in the 1950’s. Like his brother Billy, who had been Scottish Youth cross-country champion in 1955 and 1956, and Scottish Junior champion in 1959, he was a member of Bellahouston Harriers and remained so for the rest of his life. I once walked with him from the train station in Airdrie to Rawyards Park for the meeting there and he was talking about a proposed union of Bellahouston and Shettleston – a union which never came to pass and which he opposed. How good was he? His personal best times are in the table (below, left), together with its ranking in Scotland. Brian also ran in the steeplechase early in his career and had a best of 9:21.2 in 1963 which placed him third in Scotland – his highest ranking in any event in his career. He ranked 27 times for 9 different events over a period of eleven years at a time when the standard was very high indeed in the country. Possibly as a result of that, he only had one National medal to show for it – a third place in the SAAA Six Miles in 1968. After a hard duel, the winner was Lachie Stewart in 28:12.8, second was John Linaker in 28:17.2 and third was Brian in 31:10.4. At club level he ran in 12 consecutive Edinburgh to Glasgow Relays (four on Stage One, three on Stage Two, four on Stage Six and one on Stage Three) and ran in the National Championships from the Senior Boy (U15) age through to Senior Man on a total of 10 occasions. Brian was a very good clubman: Jim Russell wrote the following about his own experiences within Bellahouston Harriers. “When I joined Bellahouston Harriers in 1968 Jimmy Irvine started to give me advice on training and he told me that Brian Goodwin was the top distance man in the club and had been since he was a junior and that was because most of the best runners in the club had retired at the same time or were now past their best. He could be very abrasive and didn’t suffer fools but he always tried to help other athletes and would do anything for the club. He always wanted the club to do well in races and could become very passionate. An example of this involving myself came in my first year as a junior. I had had a good run in the McAndrew in the B or C team which resulted in being promoted to the first team for the Renfrewshire Relay running second leg. Jack Adair had an excellent run on first stage handing me a lead of 150 yards on Greenock Wellpark who had John Stevenson who was I think was already a veteran on second. I set off round Bellahouston Park with Brian expecting me to increase the lead or at least hold it but whether I let nerves get the better of me or I was just having a nightmare I was gradually pulled in by Stevenson and eventually staggered over the line about 100 yards down in 3rd place. As I hung onto a fence to stay on my feet I became aware of Brian standing next to me shouting and demanding to know what I was playing at. Suffice it to say that my reply started and finished with the letter F. Brian was pulled away by another club runner. The team eventually finished in second. Brian had a hatred of deliberate dead heats and if he was judging at a race would make sure that the runners were split. An example of this came in the Glasgow Schools Cross country Championships in Pollok estate. Frank Clement was a runaway winner of the race winning by 96 seconds (still I believe the largest winning margin in the history of the championships). However the 2nd and 3rd places were close together all the way and were actually friends living close to each other but running for different schools. Towards the end of the race they came to an agreement to cross the line together holding hands but they had not reckoned with Brian being the head judge. Brian decided that they had not been level and gave the decision to the runner who had been in 3rd place most of the race. I would not be surprised if he was responsible for splitting George Braidwood and Peter Fleming when they tried to dead heat at The Luddon Half Marathon in 1983. Brian was no respecter of reputations either no matter who the person or persons were. I was not able to attend the World Cross Country at Bellahouston Park in 1978 (blame my sister for getting married) but I heard a story which involved Brian. Apparently Brian was in the room where the results were being collated and was keeping out anyone who was not involved in doing this job. While he was standing at the door he was approached by Ron Pickering and David Coleman who attempted to get past Brian into the room. Brian put his arm across the doorway and said Where do you think you are going. The reply was We are from the BBC and we are going to get the results. Brian told them they would have to wait for results like everyone else. Back came the reply Do you know who we are I am David Coleman and this is Ron Pickering. Not the best thing to say to Brian who again told them they would have to wait although I was told he was not as polite as before(something along the lines of my reply to him a few years before). I don’t know if this is true but it sounds like something Brian would have done. As a runner Brian was one of the toughest around and was not scared to push the pace but if ever anyone lacked a finishing kick it was Brian. I remember at West London Stadium (now The Linford Christie Stadium) when Bellahouston made their only appearance in the British League Brian was running the 5000 metres and had built up a lead of about 80 metres with about 3 laps to go and looked good for the win. The Achilles runner in second place started to close the gap but at the bell Brian still had about 50 metres lead. We all thought that he was going to hold on but with 200 to go the Achilles man suddenly produced a fantastic finish to pull back the lead and despite Brian straining every sinew he was out dipped on the line. In training when I was younger Brian was always trying to teach us younger runners pace judgement but when we got near to the finish of a run the impetuous youth took over and the pace would pick up and Brian would be unable to stop us due to his lack of acceleration. When I was thinking of running the Scottish Marathon in 1975 Brian eventually persuaded me that I was too young and should wait a couple of years before doing it. I would have turned 23 a couple of weeks after the race. In hindsight I think I should have ignored his advice and run the race. 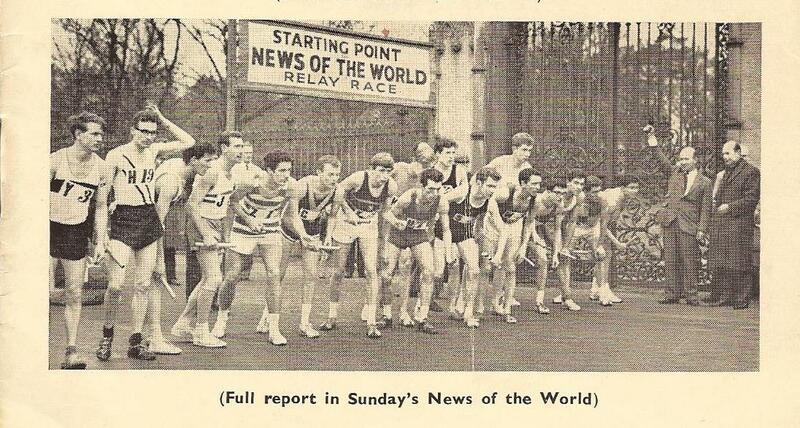 At the Glasgow Marathon in 1980 the selected Scottish Team was Jim Dingwall, Alastair McFarlane and Graham Laing. Graham withdrew due to injury and was replaced by Colin Martin but unfortunately he also had to withdraw with injury and was not replaced. In the race I stopped about halfway with a couple of niggles not wanting to put myself out with injury. After the race Brian told me that he had been trying to get me in the team in place of Colin at the last minute saying that he had been called in after the selectors had looked at the result from the previous year and taking the first Scot to finish not already in the team. I had finished one place behind Colin the year before but the selectors refused to replace Colin and Scotland started with only two runners. If I had been in the team I would not have dropped out of the race. This was just another case of Brian trying to do what he could for an athlete. On a couple of occasions during the winter months when it had been snowing Brian suggested that instead of a road run that we should go over the country. Most said it would be too dangerous due to there being about 8 inches of snow and as it was dark we would not be able to see where we were going. Brian just said you can see for miles because of the snow and he would go himself. On the first occasion I was the only one who went with him round Pollok Estate and adjoining Golf Courses and was wearing a full waterproof tracksuit. Brian was right and you could see a long way but the only problem was everything looks flat in the snow until you trip over it which I did on a number of occassions. At one point I tripped fell and because of my suit slid along on the snow. When I eventually stopped I was looking down over the top edge into a bunker. Brian never tripped or fell once but had a good laugh at my misfortunes. Brian other than competing for the club served on the committee in various positions. During my time at the club he served as Secretary, Treasurer, Chairman and President and represented the club on various committees at County, Area and National level taking various posts on these committees. At one club committee meeting there was a letter read out which was from a young athlete who wished to change from his present club in Greenock to Bellahouston. Brian stated that he did not think it would be in the interest of either club to allow this young man to change club and that the athlete should remain with his present club until he was older and possibly better placed to make this decision to change clubs. Brian persuaded a majority of the committee that this was in the athlete’s best interest and the transfer did not take place. The athlete in question was Tommy Murray around 18 years old at the time. For Bellahouston this may have been one of Brian’s worst moments. That’s what Jim had to say and if we look at Brian’s career as an official, we get a remarkable picture. He was President of the NCCU in 1976-77 and SAAA West District Secretary from 1981 to season 1995-96, following up as West District Secretary of SAF and then SAL from 1996-97 to 2006-07. If we take just one year – 1995-96 – and see his entries in the SAF Federation Handbook for that year we see Brian listed as Secretary of the Road Running and Cross Country Commission, Track and Field Commission West District Secretary and Delegate to the UK Road Running and Cross Country Federation. He was also a life member of the Federation and was qualified as a track referee with Grade 1 Track Judge and Grade 1 Marksman qualifications plus Grade 3 time keeper. He was also noted as being available for Administrative Duties for Drug Testing and as a Presentation Stewart. There are many stories about Brian and I’ll come back and add some of them but to finish for now, Doug said in the obituary that Brian was an athlete of modest achievements but was a prodigious figure in the sport.